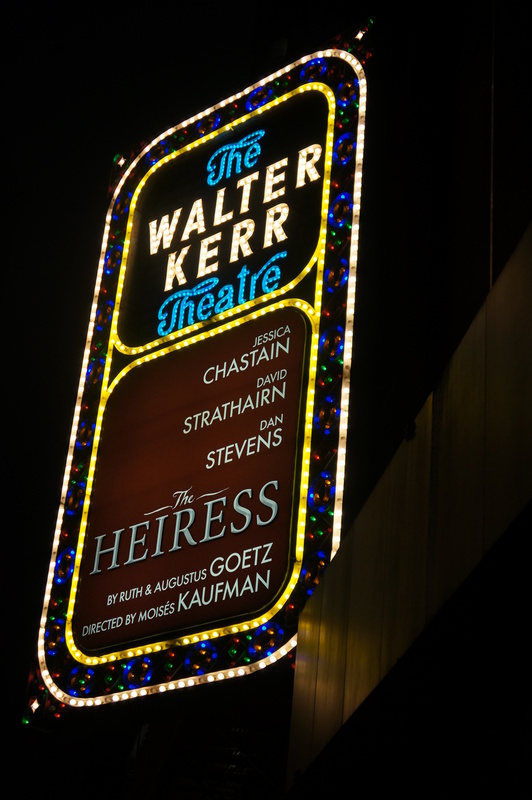 One of the items in my Happy Birthday, Jesus Christmas bag was tickets to the play The Heiress. Much of the draw to this performance was the cast, for sure… and with good reason: Jessica Chastain, Dan Stevens (Matthew Crawley!) and David Strathairn (SVU) certainly made for a talented and attractive cast. As far as talent – Chastain runs away with the show. Her character requires the most range, but Chastain is so convincingly boring and drab and then so wonderfully developed and triumphant. We saw her on Saturday night, and then we watched her accept the Golden Globe for Best Actress the following night on TV…. which was pretty cool. However, it was a much darker story than I expected… Flex your brain back to American lit, and remember Henry James’ Daisy Miller. The story of a young ex-pat in Rome named Daisy who falls in love a socialite named Winterbourne. Short novella shorter, Winterbourne spurns Daisy for her lack of status and overly flirtatious manner, and she ultimately falls for an Italian, much to the chagrin of the ex-pat community, but she doesn’t care. Winterbourne discovers her at the Colosseum with the Italian, and Winterbourne scolds him for risking Daisy’s life by risking exposure the Roman flu. Daisy says she doesn’t care about Winterbourne or the Roman flu and ultimately gets sick……….. and dies a few days later. Similarly, “The Heiress” (based on James’ novel Washington Square) hinges on the end of innocence for our heroine. Obviously, an heiress, Catherine Sloper (Chastain) is a bit dull but finds herself being courted by the lovely Mr. Townsend (Stevens/Crawley), who swears to love her for who she is. Catherine’s brilliant but emotionally debasing and abusive father, Dr. Sloper, tells her from the start- there is simply no way Mr. Townsend actually finds you attractive. It is only your money he is after. So he forbids her from marrying him or he will disinherit her and decrease her fortune, leaving her only with her mother’s portion. So we the audience hate her cruel father, and we love the promising Mr. Townsend. Dr. Sloper is a mean, mean man who lost his perfectly idealized wife in childbirth and has never gotten over it. Nor has he forgiven his daughter for being born and for being so much less than his wife was – socially, physically, musically…. etc. So Catherine decides to run away with Mr. Townsend and give up her father’s portion of her inheritance, tells Mr. Townsend of this plan “so they can be together” and Mr. Townsend promptly disappears… leaving her distraught. He returns two years later, once her father has passed away, and Catherine has her full inheritance. At this point, she tells Mr. Townsend to go pack his things and return for her, and they shall run away after all. She still loves him! And he has come back for her! But no. She knows now, the worst irony of all is true, her father was right. She may not be beautiful, but she can’t un-know what she knows. When Mr. Townsend returns, she leaves him on the stairs, knocking and shouting her name. She instructs her housekeeper to bolt the door, and with the wool lifted from her eyes, she and her fortune silently ascend the stairs before the current falls. Both Daisy and Catherine change their lives the moment their innocence is gone – Daisy is no longer concerned with the politics and inner-tensions of the ex-pat society in Rome, so she falls for her societally-suspect Italian anyway. And she loses her life. Catherine can’t lie to herself any longer, and knowing she may never meet another man willing to marry her for her money or otherwise, she chooses to live alone, leaving the only suitor she ever had on the steps. Which for me, was oddly satisfying.